What does E=mc2 actually mean? 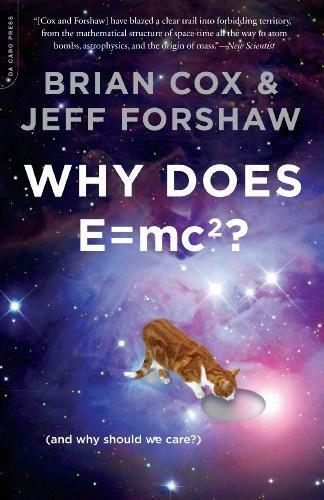 Dr. Brian Cox and Professor Jeff Forshaw go on a journey to the frontier of twenty-first century science to unpack Einstein's famous equation. Explaining and simplifying notions of energy, mass, and lightwhile exploding commonly held misconceptionsthey demonstrate how the structure of nature itself is contained within this equation. Along the way, we visit the site of one of the largest scientific experiments ever conducted: the now-famous Large Hadron Collider, a gigantic particle accelerator capable of re-creating conditions that existed fractions of a second after the Big Bang.A collaboration between one of the youngest professors in the United Kingdom and a distinguished popular physicist, Why Does E=mc2? is one of the most exciting and accessible explanations of the theory of relativity.